Great news! Our turn based puzzler Rustbucket is OUT NOW 'Free' for your devices. Get to grips with the campaign mode and then take your new found skills and dive straight into the endless dungeon for the ultimate roguelike challenge. 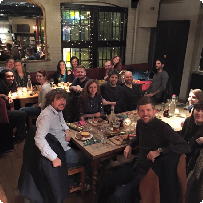 What better way to get us all in the xmas mood than an update to our fast and frantic game Roller Polar! Unlock new bears in the Bearwear shop and take them out for a roll down the mountain, who wants to play as Bare Bear? We have made a few other gameplay tweaks aswell to smooth out the difficulty curve. Theres gold to collect for extra challenge, some obstacle pattern changes, the characters each have there own wails, growls and squeaks and even the annoying eagle has had an upgrade. For those of you who missed it the first time round. You can grab it FREE for your device here! 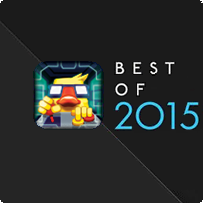 We are very pleased to hear that Gunbrick has been awarded one of the best games of the year on the iOS appstore. There are lots of truly amazing games being featured with Laura Croft Go taking the #1 top spot. Go and check some of them out, we are sure you wont be dissapointed. For anyone who hasn't tried Gunbrick yet take apples advice and play one of the best games of the year. For all of you that have, a huge thankyou for your support. We are really chuffed to bits. 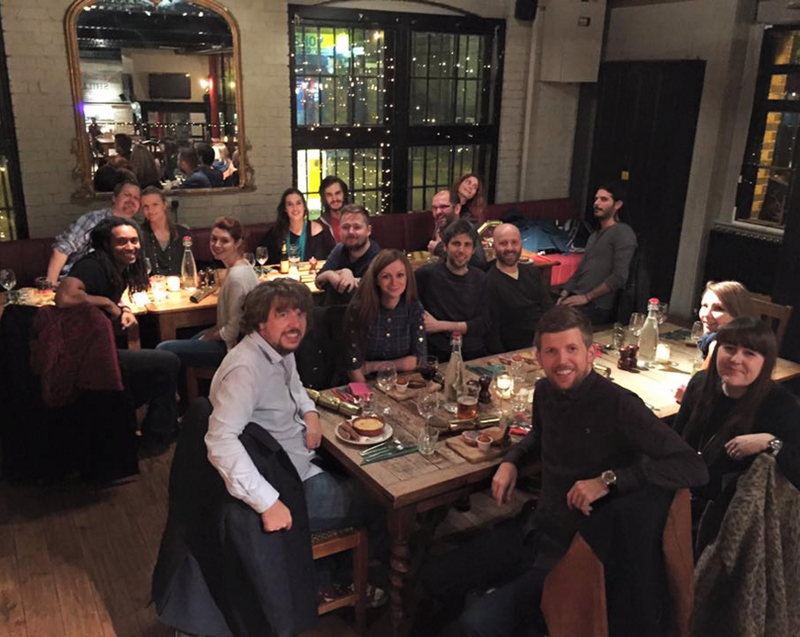 We are all nursing some rather sore heads this morning after an early festive chrismas party last night. Check out the group mugshot of the Nitrome crew (and partners). Our hero Rust Bucket and his turn based friend's are in a spot of bother after being ambushed by a pack of slimes. You can pick up allies and use them to get you out of a tight squeeze in the endless dungeon and level mode. They mimic Rust Buckets movement so can be used to strategically gain advantage in battle, or hold down multi-switches or save villagers. In Fact they can pretty much do whatever you can... yeah we know, sounds useful doesn’t it? The current plan (all going well) is to release Rust Bucket before xmas. In-fact its already been submitted to the stores and is awaiting review. 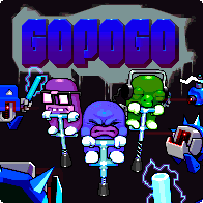 Gopogo our free ultra hard platform bouncer is OUT NOW on your devices for Android and iOS. Be sure you check out the AWESOME music by Eirik Suhrke who's titles include Ridiculous Fishing, Spelunky and most importantly our very own Gunbrick and Platform Panic. Some of you may have noticed the lack of news on the blog lately, rest assured it's not because we are taking it easy. Far from it, we are working harder than ever making a bunch of brand new games for you to get your gaming mitts on. We don't always get the time every week to fill you in with lots of news and teasers. We try to post as much as we have time for, the rest of the time we are hard at work. Make sure to follow us on Twitter (@nitrome) as-well as our blog for all the latest news, info and gossip. 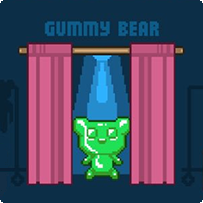 p.s Has anyone managed to unlock any of the games many nitrome cameo's yet? Phew! it's Friday again after another extremely busy week. 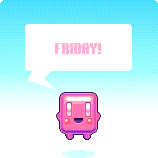 Time to fill you in with some details of what’s been happening this week here at Nitrome towers. First off our next game Gopogo is out soon, in-fact it's going to be hitting the stores NEXT WEEK and we couldn't be more pleased with how it turned out. Rust bucket is coming along leaps and bounds and we are wrapping up the finished product into a pretty bow to submit to the stores fairly soon. We are aiming for and Xmas release on this one. Codename jump is finally being picked up again after a long break finishing off other projects. We will fill you in on some of the details of this as development progresses within the coming weeks. It's so far looking and feeling rather special. We have also got another two projects in early development and the Go pogo team is going to be starting a third within a week. This means there should be a glut of exciting games for you in the New Year. Happy gaming Nitromian’s have a great weekend. p.s sorry for the lack of posts AGAIN. we'll try and improve a little and give you all some more juicy gaming dev news soon. In fact, it will be released on stores at some point late NEXT WEEK! It's not Rust Bucket that we have been talking about recently but rather 'Go Pogo' which has been developing much more quietly behind the scenes. So with that in mind we thought it was time to change all that and break out a quick little Gif for you all to enjoy. This is taken from one of the levels in the game but there is also an endless mode for the High score chasers amoungst you too. More info on Gopogo as we get closer to launch next week! As a little Friday treat (for those who just don't like to read) we though we'd show off Rustbuckets Endless dungeon in all its glory. A different experience EVERY time you play! Only the bravest monster slayers will survive to room 10+! EDIT: There WILL be some sort of training level based campaign to introduce players into the carnage of the turnbased endless dungeon. We will show more of this soon! We are also planning a larger Level based series of updates that will flesh out the stages into a much larger campaign with new themes and traps being introduced. Much like the original game, but bigger and better. It's been a while since we have posted... we'll anything really. The good news is that it's not because we have been slacking off. In-fact, we are working harder than ever on a whole bunch of brand new exciting games. You already know about Rustbucket and Gopogo, But we also have another two games in the early stages of development. We are as ever remaining tight lipped about them for now, but stay tuned to hear more about these in the coming weeks. Now back to the games you already know are coming! Beneath The Lighthouse - We were really pleased with the response on this game. We really do love and appreciate all of our fans and try our best to update and get it working on as many devices as possible. This was quite a large intensive title, so thank you for your feedback, kind words and patience. The web build is undergoing some testing at the moment so with any luck (fingers and toes crossed) you all shouldn't have to wait too much longer. Gopogo - is our next upcoming game. And you might be surprised to hear that it's ALREADY finished, submitted and awaiting review on the stores. We are really happy with the way it has turned out and will fill you in with some snippets of info and teasers soon, #Hypetrain! Rustbucket - Our spiritual successor to Turnament is coming along v-nicely. We've been working hard on a super fun procedurally generated dungeon so it’s different every time you play. It will have some sort of level based challenge structure that sits alongside this mode to ease the turnbased newbie’s into the carnage of the endless mode. We are also planning a series of updates in which more levels with new themes and challenges are introduced. For anyone who remotely enjoyed the original, its going to be epic! EDIT: ver 1.0.5 fixes another few bugs that have reared there ugly heads on Android. - Sound bug fix, bg noise was playing when muted over some devices. you can now listen to your misic in peace. - Sound improvement. The sounds were out of balance on Android because of the Mono formatting options in Unity. You should now experience balanced in volume for all sound throught the game. - Fixed skip button and freezing bug at the start of thegame. - Optimized level 14 to run a little better on slower devices. - Fixed crumble block particle bug. - We now do not force people to watch the beginning cut-scene. It was causing a lot of people issues, esp on lower end devices. -Tiny bits of polish like the lanterns now don't swing so oddly in places. -Build size on iOS is now a lot smaller that the initial release. We appreciate all of your support and kind words and reviews. WAHOO! After much hard work, Beneath the Lighthouse is available on the brand new Apple TV. It even has snazzy controls in which you spin the world with your thumb, neat! 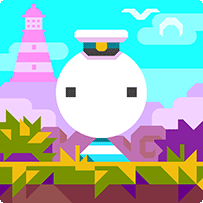 For anyone who missed yesterdays big release of Beneath the Lighthouse it's OUT NOW and available on GooglePlay and the Appstore for free. We are very pleased by peoples positive response's so far and are really looking forward to any 'reviews' or 'fan-art' (*nudge nudge wink*) that appear over the coming weeks. We plan to include one review quote from a fan in the apps description alongside any nice site review scores, so who knows you could have your name up in lights for all to see. We are listening to complaints about the game crashing on some peoples devices. We are going to do more tests on an ipod5G and try our best to see if we can resolve this issue. We will let you know in a mini update if we get it working smoothly. Thanks for all of your support (for those of you lucky enough to be playing the app already). If your waiting in the wings for the web build, why not watch our extended release trailer to wet your appetite. Our puzzle action roller Beneath the Lighthouse is now available to download on your devices. Get the game for your device here! We have had a handful of complaints about crashes (so far usually on lower end devices). The game should technically work on most androids who run 4.0.3 and up. If you can please give us details on where the app has crashed, as-well as your device model and version number. We will try our best to get it working on as many devices as we can, but unfortunately there are no guarantees. iOS users - require iOS6 or later and iPhone5, iPad3, iPadmini2, iPod5G or later! It may work on lower end devices but we can't guarentee how it'll run. We have an update on the way for iOS that reduces the file size considerably and also squashes a few nasty bugs. Beneath the Lighthouse is out TOMORROW across your mobile devices, so you wont have to wait long to discover all of the devious traps that lie beneath the lighthouse. FUN FACT! did you know that beneath the lighthouse has a Speed run system in place, with Gold, Silver and Bronze reward for the fastest possible times? It's going to be a REAL challenge to get all gold across the board. More news about Beneath The Lighthouse and our other projects soon.